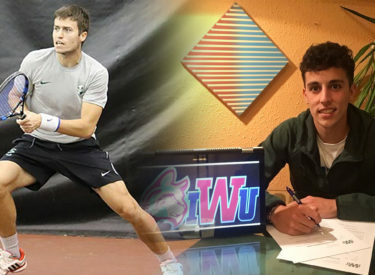 LIBERAL, Kan. – Two Saints tennis players will be continuing their careers as Duro Opacic signed with Division I Utah State and Diego Freire signed with NAIA Indiana Wesleyan on Thursday. After two years of record breaking play with the Saints, Opacic will look to continue his success in Logan, Utah with the Aggies. Opacic leaves the Saints with his named all over the record books, including the most career singles wins in program history (34) and third most career doubles wins in program history (34). He helped lead the Saints to the two winningest seasons in program history, including leading the Saints to a third place finish at the NJCAA National Tournament his sophomore season amidst an NJCAA All-American season, becoming just the second Saint to achieve the feat. He was also named an ITA All-American his sophomore season. Opacic joins a Utah State squad that went 19-9 last season with a Mountain West Championship for the third consecutive year. Freire will head to Marion, Indiana to join the Wildcats of Indiana Wesleyan next season. He spent two seasons with the Saints, losing just one singles match in the process while earning a 7-1 career record including a 5-1 record this past season. In doubles play, he went 3-1 in his career, including a 2-1 record in 2018. Freire will join an IWU team that went 29-11 last season while advancing to the NCCAA National Semifinals. They finished the season ranked No. 23 in the country.